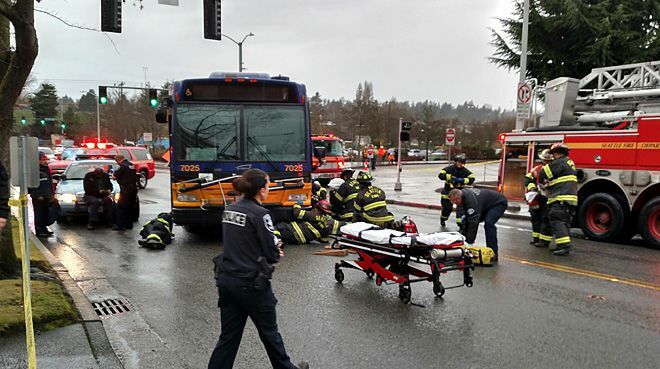 An elderly woman was crossing at a crosswalk at the Northgate Transit Center when a Metro bus struck her, according to police. She was pinned under the bus after the crash, and although firefighters eventually were able to free her, she was pronounced dead at the scene. An SPD Drug Recognition Expert was called out to test the bus driver, and no obvious signs of impairment were found. Metro spokesman Jeff Switzer stated, “The driver was very shaken up and distraught over this collision,” and told the press that he had no history of safety concerns or serious collisions. Per Metro’s policy, the driver has been placed on administrative leave until the results of drug and alcohol testing come back. If the bus driver is found to have been operating his vehicle with disregard for the safety of others, or if drug and alcohol testing reveals that he was operating under the influence, he may be facing charges in criminal court for vehicular homicide. Metro Transit may also have separate disciplinary procedures for drivers who cause accidents and deaths. If investigation finds that the driver wrongfully caused this woman’s death, her family may also have a case for a civil lawsuit. When a driver who’s not operating a bus or a commercial vehicle gets into an accident, civil lawsuits involve that driver’s insurance company. When someone is operating a vehicle for work, lawsuits get more complicated. In some cases, a victim may need to file a lawsuit against the company that employed that driver and maintained the vehicle. For victims who are injured by vehicles like city-owned buses and trains, getting restitution may involve suing the government. If you or a loved one has been injured in an accident involving a city or state-owned vehicle, it may be time to consult with a pedestrian accident attorney about your case. These cases may be complicated, since depending on the circumstances, multiple agencies may have to be named in a civil suit.